Cooking has always been a great passion of mine but, it does come with its hazards. I have had a lot of burns and I learned the hard way that the best way to avoid these is to get the best oven mitts in the market. 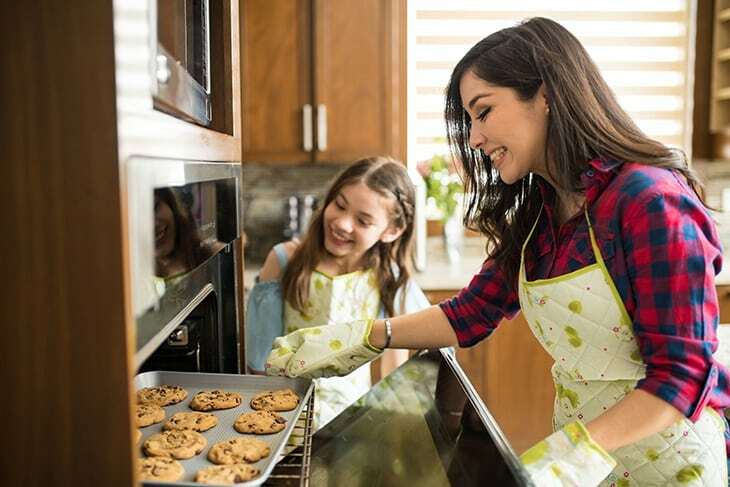 Oven mitts should not be taken lightly, they are there to protect you from getting unwanted accidents in the kitchen. I used to always just get the cheapest mitts I could find but these don't really hold up too well and I always end up just buying a new one. It was just last year, I think, when I had a pretty bad burn from using a cheap oven mitt. I got burnt and I dropped the meal that I cooked in the oven so it was really a bad day for me. 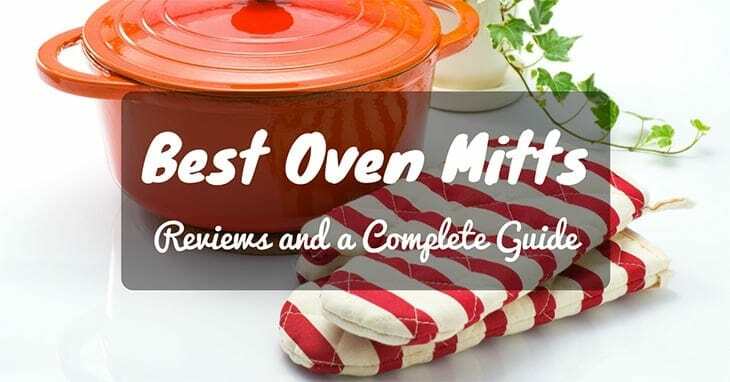 From that day on, I made sure that I would only buy quality oven mitts and that I would hopefully help others to not make the same mistakes that I did. I am not going to lie, the first thing that really caught my eye with these oven mitts are the wonderful colors it has. You can choose from 8 colors and it would definitely have whatever color your kitchen (or heart) calls out for. Since I was so focused on the color, at first, I didn't even care about how well it would perform. As you might have already guessed, I got this when I was first trying out to cook. That being said, I am still completely impressed with how well this oven mitts work. It is made of silicon so there is absolutely no transfer of heat, which is usually the case when it comes to other materials of oven mitts. Although it is made of silicon and a bit thick, it is still really flexible. This is the usual problem I have with thick oven mitts, they don't give the flexibility I need to perform all the tasks I would need in the kitchen. They often just get in the way so, in my annoyance I would eventually take them off. Also, the lining is actually made of cotton so it is still very comfortable insideAside from protecting your hands, I also love that these oven mitts also protect my arms. Since it is longer than the conventional oven mitts, my arms are completely protected from getting further burns. What I also found very useful with this is the rugged and textured surface it has. Although I haven't tried a ton of oven mitts before this one, I have tried ones that aren't textured and I have had one or so accidents with those. They were quite slippery and didn't work that well with ceramic and glass containers so I have lost a few dishes because of this. So, you can just imagine how in love I was when I finally found these oven mitts since they didn't let anything slip off my fingers.Another great thing about this brand is that their customer service is also top notch! They have money back guarantee in the off chance that you won't love their product. Aside from me, other previous customers also loved these oven mitts. They were really impressed at how well these protected them from burns. These Nouvelle Légende quilted oven mitts were the first oven mitts that I got. What drew me to it is how it reminded me of the oven mitts my mom used when I was young. Since it was my first time to get oven mitts, I didn't really look too much into whether it would give me the protection I would need for cooking. That being said, I was pleasantly surprised that this did not only give me something to be nostalgic about but it also gave me great protection. The gloves are pretty long and cover up my forearm so I didn't need to worry about the heat whenever I took dishes out of the oven. Another great thing that I love about this is that it is flame proof. I can personally attest to this feature since one time I accidentally laid the mitts too close to the stove. Although I did see the mistake immediately, if the mitts weren't flame proof they would've certainly caught on fire. This was also tested out in a laboratory and they found that it could withstand 500 degrees fahrenheit of heat. But I would still not recommend testing it for yourself. Since it is made of quilt, it's suitable for both indoor and outdoor use which I find very useful. We often have barbecues so having oven mitts that does both is really great for me. The only thing that I could say didn't work for me with these is that they're not that flexible. It's also not textured so I have lost one or two dishes because it got a bit slippery. What really caught my eye with this Life Quintessentials silicon oven mitts is the fact that it is silicon outside but it is lined with really comfortable cotton inside. This means that you won't get that sticky and sweaty feeling while wearing it. This has been a huge issue of mine with the other silicone mitts I have tried. The cotton lining also allows easy removal. There have been a handful of times where I felt like I'm in a tug of war with the other purely silicon mitts I have tried and this is such a breath of fresh air for me. I also loved that it's not just fire proof but it is also waterproof. This makes it easier to clean since you won't really need to wash it completely.With all of its nifty features it does come with a relatively hefty price tag. This is something that I don't particularly love about this item. Although it is great overall you would get almost the same features in other items for almost half the price. 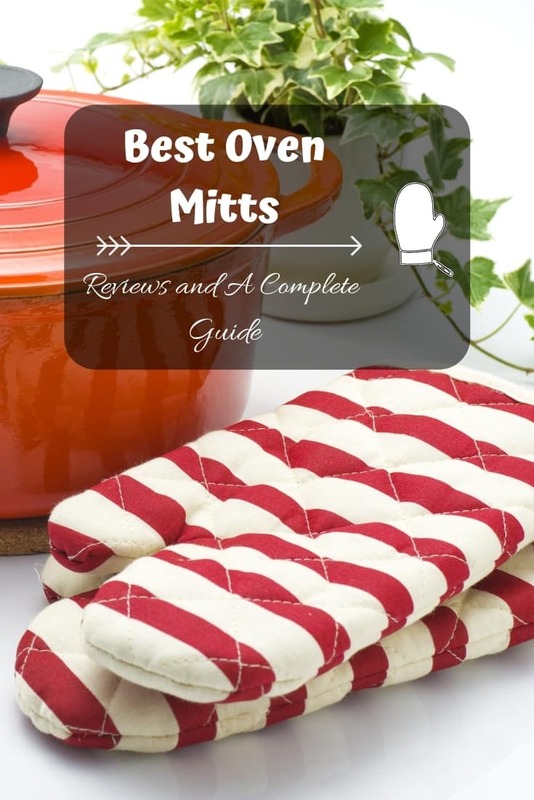 Best oven mitts – best reviews and a complete guide! When I first saw this Cuisinart oven mitt I was caught off guard. For me, it was clearly the best of both worlds. It offered comfort, protection, and functionality. It has a soft plush interior so it was comfortable to use and the texture inside is so soft that sometimes I don't even want to take it off anymore. Although it is soft inside the outside gives 100% protection from the heat and from getting burnt. 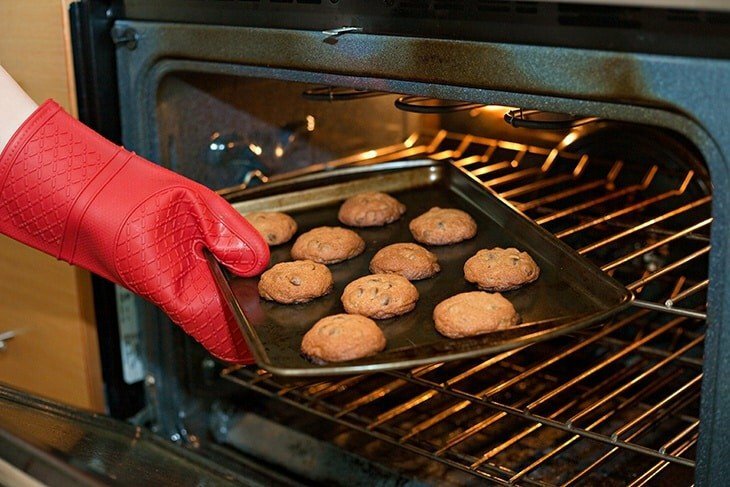 The gloves are long enough to cover not just my hand and my wrist but also my forearm which I think is very important especially for those who use the oven a lot. It also has a silicon grip. This means that it is textured so there would be almost zero troubles with glassware slipping off while you're using these mitts.Another thing that I found very unique about these mitts is that it has a puppet design. It looks exactly like how you would use your socks as puppets as a child. This gives it a fun use for kids and kids at heart. But don't mistake this design as purely for entertainment, this was actually designed this way to give you better grip and more flexibility when you pull your pots out of the oven. Okay, so maybe this isn't a typical choice for a lot of people but I must say the cute bear detail really caught my eye. At first I thought it would just be a novelty item that I could pull out once in awhile maybe during Halloween or when I'm feeling silly but this proved to be more than that. The whole oven mitt is made of heat resistant cotton so you won't feel sticky or sweaty while using it. When I first saw that it was indeed made of cotton I was a bit apprehensive since I was scared that it wouldn't be heat resistant enough but to my surprise I didn't feel any heat at all while I was using it. The “paws” part also have silicon on them so there's no worry about dishes slipping off.The only thing that I could say isn't so great about this is that it is relatively pricier than the others on this list. This is completely understandable since it is a novelty item but, personally, for the quality and the cuteness factor it could be worth it. When purchasing an item there are really a lot of things that you should be wary of. Below I have listed the top things to look for when buying your own oven mitts. A great oven mitt would always have the right size and this might mean different things for different people but I would suggest you to get one that covers a considerable part of your forearm. The reason behind this is because when you use the mitts you're usually taking things out of the oven and if they only cover up to your wrist you'll have a higher chance of getting burnt in that area. This would also protect you from the heat when you reach inside the oven. People of course have different preferences when it comes to this area but for me, the best is to have the best of both worlds. Getting an oven mitts with a cotton interior for comfort and silicon grip for functionality would be the best choice. This would allow you to get a pretty good grip on your meal without being subjected to the heat and discomfort that most silicon gloves cause. If you're like me and are very particular when it comes to your budget this is an area that you would most likely pay particular attention to. The list above gives items at different price points and would definitely allow you to have a good base on what the market is like. I would say that it would be smart to get inexpensive oven mitts that still gets the job done especially if you won't be cooking a lot. All the five items above are amazing in their own rights. They offer different things and cater to different needs. However, for me the Homwe oven mitts are the obvious winner. It offers me great comfort even if they are silicon since the lining is cotton and of course they give the best performance. I have never had any problems with this and I know you wouldn't have any as well. If you feel like I left out any notable oven mitts or maybe you have other tips, please feel free to comment them down below. Until next time!